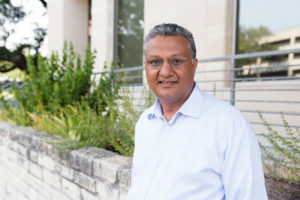 Srinivas Bettadpur, an associate professor of aerospace engineering and engineering mechanics and the director of the Center for Space Research at The University of Texas at Austin, has been awarded the NASA Exceptional Public Achievement Medal by the National Aeronautics and Space Administration. The award, established in 2012, is presented annually to individuals who have distinguished themselves by making outstanding contributions to a NASA mission. Bettadpur’s award recognizes exceptional achievement in furthering the goals of the Gravity Recovery and Climate Experience (GRACE) mission through the improvement, validation and application of GRACE’s unique mission science data. GRACE offered a paradigm-sift in measuring the planet’s variations with its twin co-orbiting satellites, which allowed for continuous, highly precise measurements of variations in the Earth’s gravitational field. These satellites provided important data on the rate of melting ice, rising ocean levels, depleted aquifers and more. Retired in 2017, the twin satellites were replaced in May with twin satellites that will take even more accurate measurements of Earth during the GRACE Follow-on mission. Bettadpur’s research areas of expertise are in orbital mechanics and space geodesy. His research is focused on the modeling and analysis of Earth’s dynamics through space-based metrology and remote sensing and the connections between global space-geodetic measurements and their regional applications. He is the principal investigator for UT Austin’s efforts for the GRACE Follow-On Mission which replaced the existing twin GRACE satellites in 2018. Bettadpur was instrumental in establishing a UT-NASA partnership for a next-generation geodetic observatory at UT’s McDonald Observatory in West Texas. Through their research in mm-precision positioning techniques, Bettadpur and colleagues will enable a generational shift in the metrology and characterization for reference frames and natural hazards. Bettadpur is a fellow of the FSX Professorship in Space Application and Exploration. He is a fellow of the International Association of Geodesy and an associate fellow of the American Institute of Aeronautics and Astronautics. He was the recipient of the 2007 NASA/USGS William T. Pecora Team Award for the GRACE mission and the European Geosciences Union Vening Meinesz Medal in 2016.